Roll-Arounds Self Stick Wheels.Makes most anything mobile, instantly! 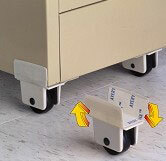 Roll-Arounds® Self Stick Wheels. Steel reinforced wheels hold up to 250 pounds. Makes most anything mobile, instantly! The first universal wheel of its kind! No tool needed! Just peel, stick and roll! Flat, U Shaped and Angled mounting options. Industrial-Grade high tack adhesive use specially formulated to bond tightly and permanently to metal, wood, laminates, vinyl and cardboard. Set of 4 steel reinforced wheels hold up to 250 pounds. Ideal for use on TV and media stands, microwave carts, storage containers, file cabinets, tool chests, computer stands and waste receptacles. The possibilities are almost endless!